The best Level Lines are produced with the fluorocarbon material with the density 1.78. 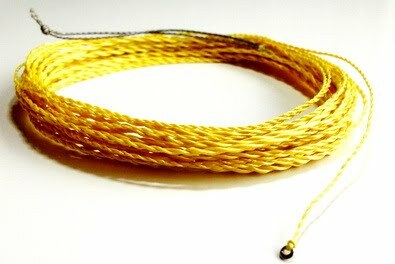 Much heavier than nylon and co-polymer, it is less effected by the wind when casting. It's difference in suppleness and memory is very small; the main difference is the color and visibility. The line visibility is very important for tenkara fishing. Different colors give you the variety of the opportunities to monitor your line’s position in the air and against the background of the water and the banks. Tenkara level lines are supplied on spools – and are simply cut to length for use (any length that you want). So if buying multiple rods – it may only be necessary to buy one spool of line. Note that as the line number gets larger so does the diameter of the line: 号1.5 - 0,205 mm, 号2 - 0,235 mm, 号2.5 - 0,26 mm, 号3 - 0,285 mm, 号3.5 - 0,31 mm, 号4 - 0,33 mm, 号4.5 - 0,365 mm. 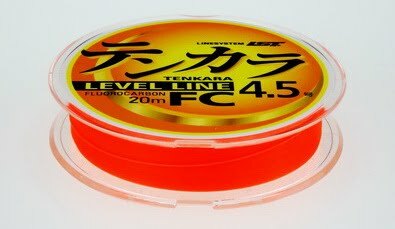 Line Systems Tenkara FC level line is made of opaque fluorocarbon material. It is very well died by fluorescent orange and the line's visibility is outstanding. Sizes 2.5, 3, 3.5, 4 and 4.5 are available in 20m spools. 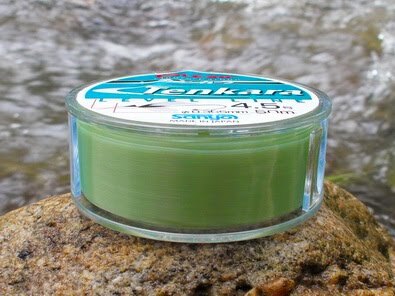 YGK Tenkara level line is made of perfect opaque soft fluorocarbon material. It is dyed by fluorescent pink and is very High Visible. Sizes 3, 3.5, 4 and 4.5 are available in 25m spools. Sunline BUTTOBI (ぶっとび) Tenkara Level Line is a premium Japanese fluorocarbon tenkara level line offering a perfect visibility and the excellent castability of fluorocarbon. The colour is a really "burning" fluorescent orange and makes the line very well visible with the largest variety of backgrounds. Sizes 3, 3.5, 4 and 4.5 are available in 30m spools. 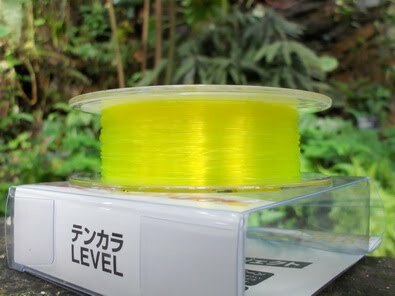 Yamatoyo Tenkara line is also transparent, but very bright fluorescent yellow, that makes it the best to be used in the twilight and under the canopies at overgrown streams. This line is the most “cost effective”, because of larger packages. This line is the most “cost effective”, because of larger packages. It is available in 50 m spools and in sizes 3, 3.5, and 4. 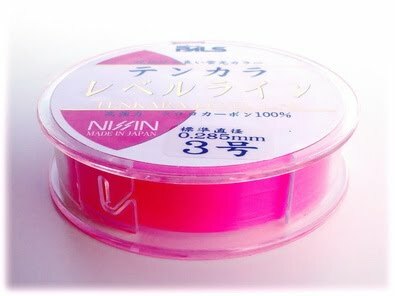 NISSIN PALS CO. is one of the leaders of the tenkara gear market, so the release of their branded level line was to be expected. It is made of fluorocarbon and died with opaque pink. Three sizes - 3, 3.5, and 4 are available in 30m spools. Sanyo Valcan Applaud tenkara line is the line with normal visibility, little softer and has less memory than others. Normal visibility is useful when the water is crystal clear, the weather is bright, as highly-visible orange or fluorescent green line tends to spook the fish. It is available in 50 m spools and size 5.5. Sanyo Valcan Applaud HiVis tenkara line is made of the same material with orange dyeing and has larger variety of sizes. The line has an opaque color and looks thicker than other lines of the same size. 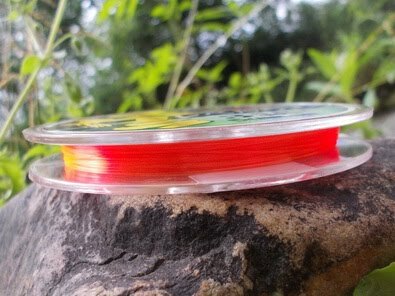 It is available in 30 m spools and in sizes 4 . 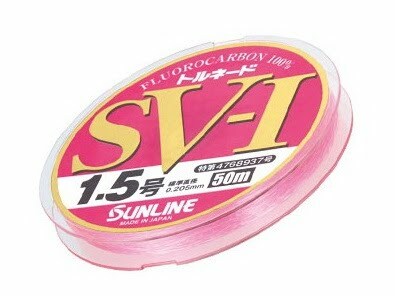 Sunline Tornado line is made of high visible pink dyed fluorocarbon material. 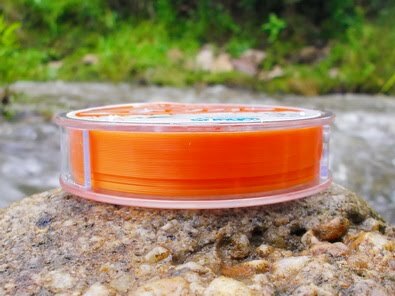 It was not initially targeted by the manufacturer to tenkara fishing, but suits it very well and is available in sizes 1.5, 2 and 2.5 in 50 m spools. Sunline KANADE line is made of high visible yellow dyed nylon material. It suits “all casting line held off the water” style very well. Expert casting skills are required when windy. The line is available in size 号3 (0,285 mm) in 50 m spools. 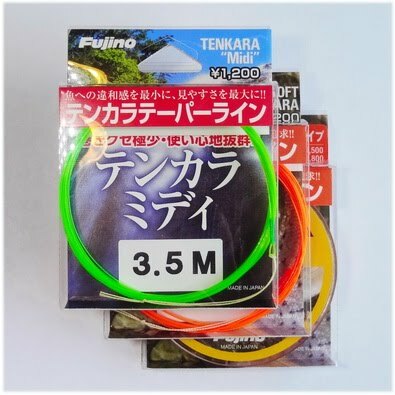 FUJINO Tenkara Line is tapered monofilament line, made of nylon. It is very well died by orange (Soft and Long), green (Midi) and High Visible. The line weight is good to load all our rods. The density of nylon is 1,14 and the line is almost floating. It will be the good choice to fish with dry flies. The line comes with an attached loop for a girth-hitch connection. The line is reviewed by Jason Klass and Christophe Laurent. 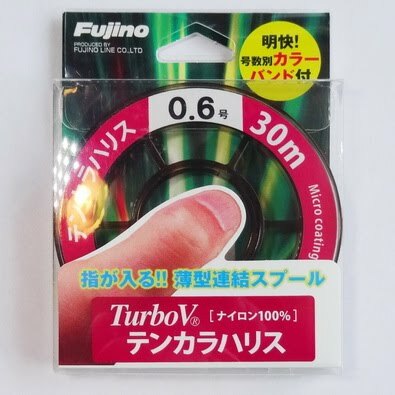 Perfect Turbo-V tippet material is produced by FUJINO especially for tenkara fishing. The ancient tenkara lines were made from twisted horsehair. Modern lines are made from synthetic filaments. Whichever material is used, you want the end of the line to which the tippet is attached to be heavy enough to turn over the tippet and fly, yet light enough that it lands on the water softly. To get a line where the tippet end is as light as possible and yet have a line heavy enough for the rods to cast, it is necessary to taper the line. This is particularly true for the stiffer rods. In addition to light weight, the visibility is critical: if your line isn't easy to see, you'll miss some the drift and you'll certainly miss some of the strikes. We offer the lines finished off with a tip ring. Kevlar is good material for "life time" lines. Main advantage is specific weight of kevlar and zero elongation for the years. The lines are reviewed by Tom Davis.